McConnell Dowell, as a part of the Stronger Christchurch Infrastructure Rebuild Team (SCIRT), is rebuilding Christchurch’s earthquake damaged infrastructure, undertaking the biggest civil construction program in New Zealand’s history. Consecutive earthquakes in September 2010 and February 2011 inflicted a significant amount of damage throughout the city. The main works being undertaken by the McConnell Dowell team include network drainage works, roading, kerbing, stormwater and water main repair, pump station construction, repairs to retaining walls, pressure wastewater installation involving the replacement of a new sewer main and installation of pumps on private properties, vacuum wastewater reticulation and vacuum station construction. With works expected in excess of NZ$100 million per year over five years, resource allocation and works planning are key challenges for the management team. Local resources are strained, meaning many subcontractors have been drawn from other areas around New Zealand and internationally. Differing health and safety, environmental and quality standards mean extensive training is required for these crews. With much of the SCIRT projects centred in residential areas, stakeholder management has been a key focus of the SCIRT project team. Months of disruption caused by repair works has placed additional strain on residents already stressed by sometimes extreme property damage. 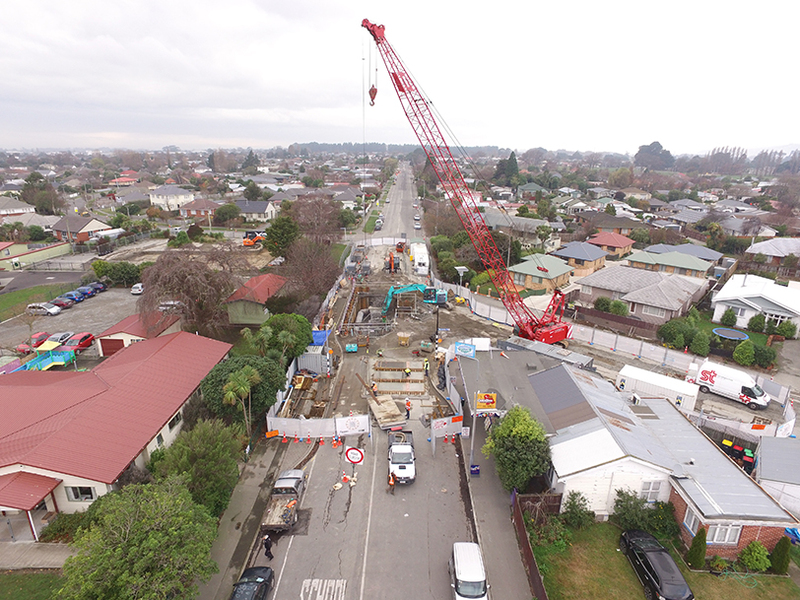 Wairakei Diversion – Construction of a new pipe running through Fendalton. The project required repair work to water supply and stormwater infrastructure, including the installation of an 825 mm dia concrete main trunk sewer and 150 mm dia collector, plus kerb and channel by dig and lay methods, and the upgrade of the road along the 1 km pipe route. Gayhurst Road Bridge - Construction of a temporary pedestrian and cycle bridge and demolition of the existing bridge. McConnell Dowell, in conjunction with the designers, developed an alternative design using pre-cast panels that were cantilevered onto the bridge, which expedited the programmed works, and reduced the environmental risks of working over water. Carlton Mill Footbridge needed to be repaired in a manner that would preserve the bridge’s heritage. Southern Relief, Linwood – A large scale project with works centred on Worcester Street and Woodham Road. The dig and relay of the 1.6 m x 1.2 m concrete pipe takes wastewater from approximately 200,000 households around Christchurch to the Bromley Treatment Plant and is essential to the wastewater network in Christchurch. Close interaction with residents, businesses and developers is a key element of McConnell Dowell’s approach to support the rebuild of Christchurch. We have developed a number of innovations to minimise disruption to residents and provide safe and resilient infrastructure. We have constructed a section of Orion’s 66 kV underground power service and introduced a Cured in Place Pipe (CIPP) to support stormwater repairs on Christchurch’s port hills and installed a vacuum wastewater system in the residential suburb of Shirley - the first area of the South Island to use such technology.